Is your advertising bringing in people? 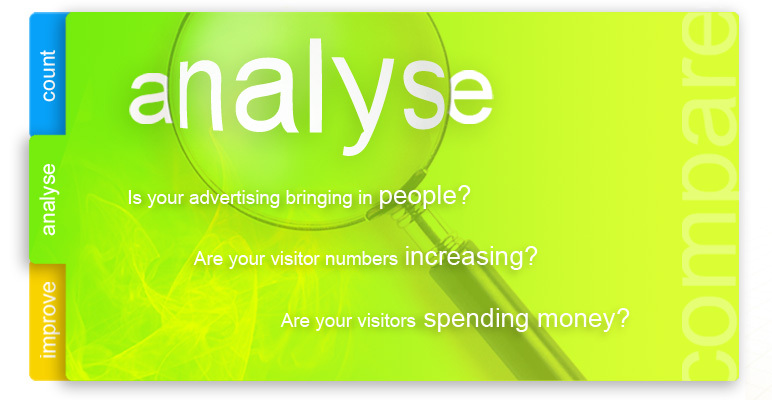 Are your visitor numbers increasing? Are the people in your business spending money? WinCounter is a software based people counter, an essential tool if your business deals with people entering and leaving your premises. This innovative people counting software will keep track of the number of people flowing through your business and the exact times they visited. Analysing this data helps you monitor key performance indicators. WinCounter has been counting people around the world for over ten years. It can be installed in a retail store, shopping centre, information centre, library, museum, club or in many other scenarios. Even if you don't have sensors, you can use the manual trigger feature to get a feel for how the software works. Sensors mounted on your doors count people as they enter or exit your business. WinCounter records this data in a file on your computer so that the entire history of foot-traffic for your business is ready for analysis at any time. 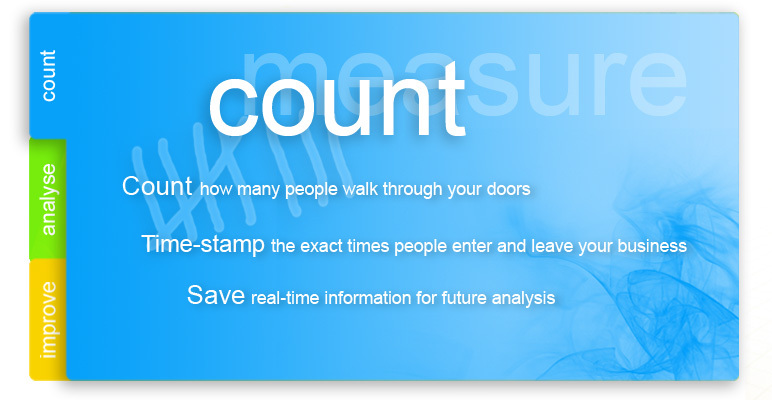 Each count is time-stamped so you are not just counting people, you can analyse the time of day they visited as well. Watch the trends in people numbers to determine the effectiveness of your advertising. Is your advertising bringing in more people? Determine your busy and quiet times to ensure you have the correct number of staff. Compare your sales to foot-traffic. Calculate the conversion rate i.e. how many of your visitors are actually spending money? Compare today's activity with the same day last week, last month, last year etc. Are your customer numbers increasing? This part is up to you! By making changes to the areas you have identified, you can improve the overall performance of your business. Make sure your advertising and marketing is bringing in the people. Adjust your marketing! Use advertising methods that are the most effective at bringing in people. Be aware of the times most people are visiting your store and make sure you provide the ideal environment for them to spend money in your store. Roster the appropriate number of staff at the right times during the day. Determine where you need to apply your resources. e.g. 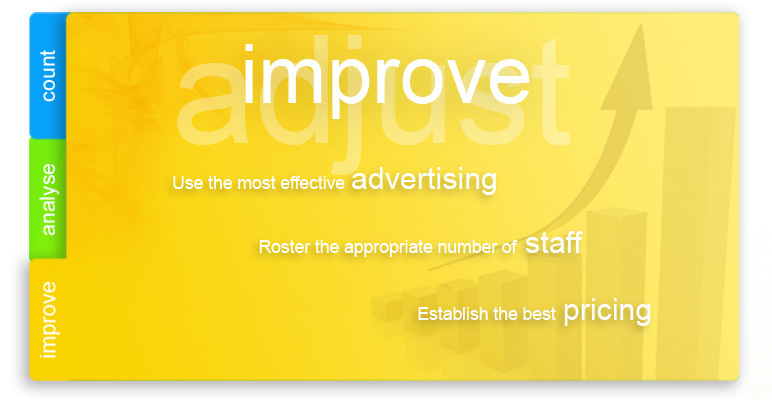 Do you need to spend more on advertising or would it be better spent on sales training for your staff? Review your pricing and special deals. Make sure these are set at the right level to encourage people to buy.